A complete history, compiled by RW Robert E. Simpson (PDF file, 234 pages) is available from the Lodge Secretary, Robert Simpson (pddgm81@gmail.com), if you would like to inquire about a copy. Under the authority of this dispensation the Lodge called the Widow's Son was opened on October 26, 1799, at Milton, then the principal trade mart of Albemarle County, on the first degree of Masonry with thirteen members present. At this initial meeting dark green was selected as the uniform or livery of the Lodge. charter was held on January 9, 1800. In the records of a meeting held on February 14, 1801, the Lodge is for the first time designated by its number as Widow's Son Lodge No. 60. In all the records of the Lodge up to that date it is referred to as "the Lodge called Widow's Son Lodge." Although referred to in the "Proceedings of the Grand Lodge of Virginia" as Widow Son's and in the early minutes of the Lodge itself as Widow's Son, the name of the Lodge appearing on its charter is Widow's Sons', which is the official designation used today. Charlottesville. The first indication of any proposed change in the location of the Lodge comes, not from the records of the Lodge itself, but in the minutes of Charlottesville Lodge No. 90, which had been organized in Charlottesville on April 18, 1812. That Lodge at its meeting on December 7, 1812, recorded its decided disapproval of moving Widow's Sons' Lodge from Milton to Charlottesville. It was not until September 11, 1813, that any formal action was taken by Widow's Sons' Lodge No. 60 for the purpose of changing its location. accepted an invitation to unite with Widow's Sons' in a public celebration to be held at the courthouse in Charlottesville. Two years elapsed before any favorable action was taken by the Grand Lodge on the petition of Widow's Sons' Lodge No. 60 that it is permitted to move from Milton. In 1813, the petition had been rejected as being unreasonable. However, at an annual communication of the Grand Lodge held on December 13, 1815, a resolution was adopted granting leave to Widow's Sons' Lodge No. 60 "to remove to and pursue their Masonic workings in the town of Charlottesville." The first meeting of this Lodge to be held in Charlottesville was on Monday, April 15, 1816, at the home of Branham & Jones. The appointment of a committee to secure a comfortable and appropriate Lodge room in which future meetings might be held was the first order of business. An order was subsequently entered at a meeting held on August 10, 1816, that the County Court of Albemarle be requested for permission to use one of the jury rooms in the courthouse as a Lodge room. The request was presented to the Court and permission was granted. On August 9, 1817, a committee was appointed to act jointly with a similar committee from Charlottesville Lodge No. 90, in requesting of the Visitors of Central College the privilege of laying the cornerstone of that institution. 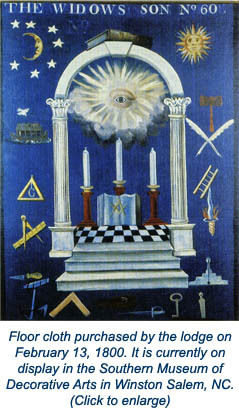 Permission for the Masonic bodies of Charlottesville to lay the cornerstone was obtained from Thomas Jefferson, one of the Visitors of Central College. The ceremony was conducted jointly on October 6, 1817, by the two Lodges with the assistance of the Visitors of Central College, each Lodge bearing an equal share of the expenses. 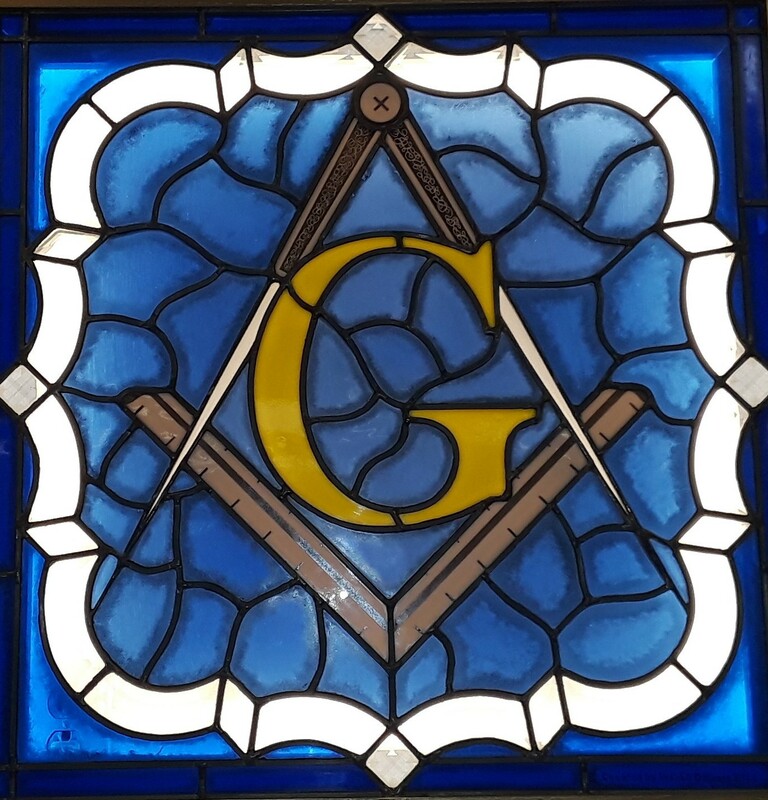 In the recorded proceedings of the ceremony and in the report of those proceedings forwarded to the Grand Lodge of Virginia, the members of the two Lodges who acted as officers for the occasion were designated Grand Officers. The Grand Lodge disapproved of the reference to these officers as Grand Officers and of the inscription of their names as such on the scroll deposited with the cornerstone, and therefore refused to sanction the publication of the ceremony. A detailed account of this interesting ceremony can be found in the February 1977 issue of "The Virginia Masonic Herald." only Masonic body in Charlottesville until December 13, 1867, when Keystone Royal Arch Chapter No. 58 was chartered. The one hundredth anniversary of this Lodge was celebrated on December 11, 1899. On that occasion a memorial tablet to Brother Frederick W. Hatch, D. D., first rector of Christ Episcopal Church and first Chaplain of this Lodge was unveiled by the Lodge at the newly erected Christ Episcopal Church. Prior to the unveiling of the tablet, a sermon was delivered by Reverend Brother H. B. Lee, rector of Christ Episcopal Church and Chaplain of the Lodge. The memorial address was delivered by Most Worshipful R. T. W. Duke, Jr., Grand Master of Masons in Virginia. Widow's Sons' Lodge has been honored by having six of its members serve as Grand Master of Masons in Virginia: James A. Leitch (1854-1855); Peyton S. Coles (1880-1881); R. T. W. Duke, Jr. (1898-1899); James B. Wood (1915); S. Dexter Forbes (1959), and Jeffery E. Hodges (2009). Three members served as Grand High Priest of the Grand Royal Arch Chapter in Virginia: Peyton S. Coles (1880); Charles H. Ergenbright (1935); and Russel G. Snodgrass (2002). Four members served as Grand Commander of the Grand Commandery, Knights Templar of Virginia: Peyton S. Coles (1881-1883); Harry M. Wilson, Sr. (1941-1942); E. Bryan Goddin (1975-76), and Jay L. Cotner (2004-05). Confederate Soldiers Monument (1909); Laurel Hill Baptist Church (1914); Charlottesville Public Library (1919); First Methodist Church (1924); George W. Wright Memorial Pavilion (1926); University Baptist Church (1926); Charlottesville Masonic Temple (1959); Temple Beth Israel (1982); Charlottesville Senior Center (1991); Broadus Memorial Baptist Church (1993); Congregation Beth Israel (1995), and Church of Our Savior (2005). This Lodge has over the years held its meetings in the courthouse, hotels, taverns, churches and private homes. On April 8, 1892, the Lodge was informed that the Marshall property on the corner of North Fifth and east Main Streets had been purchased. On September 30, 1892, this Lodge met for the first time in its own Masonic Temple, where it has continued to hold its meetings. 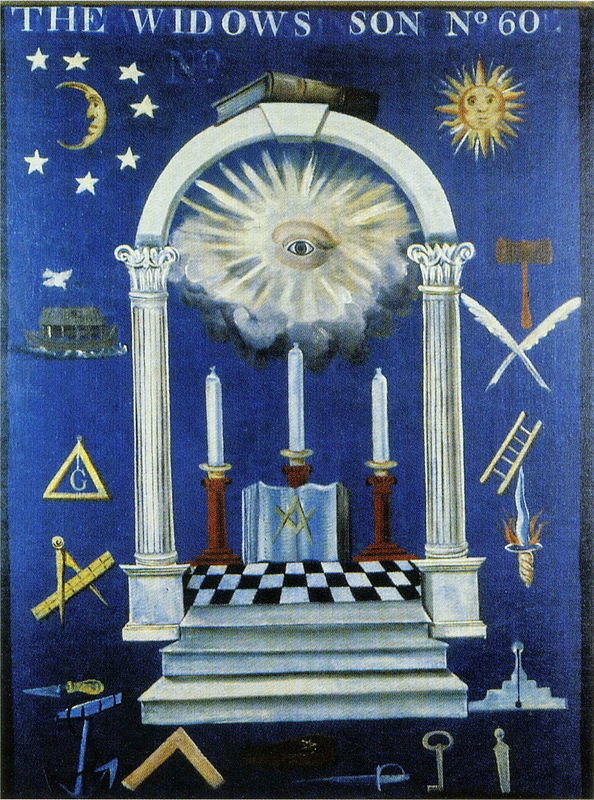 In the early 1950's, the Lodge began to discuss and plan to build a new Masonic temple. The plans became a reality and the cornerstone was laid on July 25, 1959, at the same location on the comer of Fifth and East Main Streets. The official opening was held on May 21, 1960, and the Temple was dedicated on May 30, 1980. During 1999, the Lodge celebrated its 200th anniversary. A gala weekend in December of 1999 brought the celebration to an end with a wreath laying ceremony at the graves of three Past Grand Master’s who belonged to the Lodge; a Master Mason’s Degree was conferred on a candidate by the Past Master’s; an open house with a display of the lodge artifacts; a rededication ceremony held at Christ Episcopal Church; A Bicentennial Plaque was unveiled; A Time Capsule was sealed to be opened in 2049; and a banquet with entertainment and dancing was enjoyed by all. The future of this venerable Lodge, like its past, is marked not by a page blank with insignificant undertakings and accomplishments; but rather by the execution upon the Trestle Board of works worthy of inclusion among the many distinguished achievements resplendent in its past. This portion of the site is still under construction. Please check back regularly for updates.